Lee's Company may just do what Waylon and Company failed to do back in 1978 when the original White Mansions hit the street in a hail of hype: break out. The 1978 package, put together by A&M, was one hell of a package, full sized pamphlet packed with everything you needed to know about the story and recording, but for one reason or another, sales fell short of expectations. That does not mean that it did not sell, rather that it did not evidently sell well enough because shortly after the pre-release and month of release blitz, it fell off of the label's radar and, outside of a small but loyal following, off the map altogether. Maybe the world was just not ready for a concept album, at least not one of the country-ish variety, or maybe the world was not ready to embrace the Confederacy in all its glory. Whatever the reason, the album was never given its proper due, in my estimation, so it is good to see Lee's Company take up the standard. And, no, this is no tribute album. 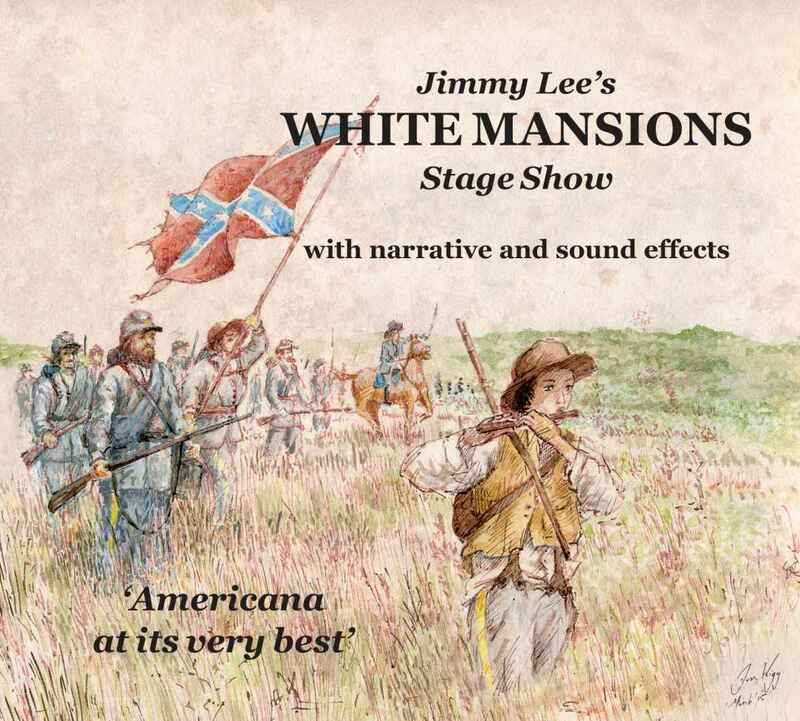 Read Jimmy Lee's full bio and you'll see that at the time of the A&M release or thereabouts, he was touring and playing everything White Mansions and might have had a great run if an unethical manager had not absconded with all proceeds lining his pockets. Played Nashville, in fact, and did quite well, actually, and when you hear this recording, you will know why. Blessed with voice somewhere between Gary Cooper and Waylon Jennings, Lee was born to this music like moth to flame, as they say. Unlike the staged 1978 concept, Lee sings all leads (except for the officer on "Bring Up the 12-Pounders") and one might think it would not work, but it does. Lee sings with a kind of disaffected conviction which bleeds into each song—you soon forget which part he sings because it really doesn't matter, it's the story that counts. And it doesn't hurt at all that the band nails not only the songs but the sound. It is an amazingly full sound this small ensemble creates, from bass to acoustic and electric guitars—and there are points at which Clare Juliet makes the accordion mellotron-like, I swear. 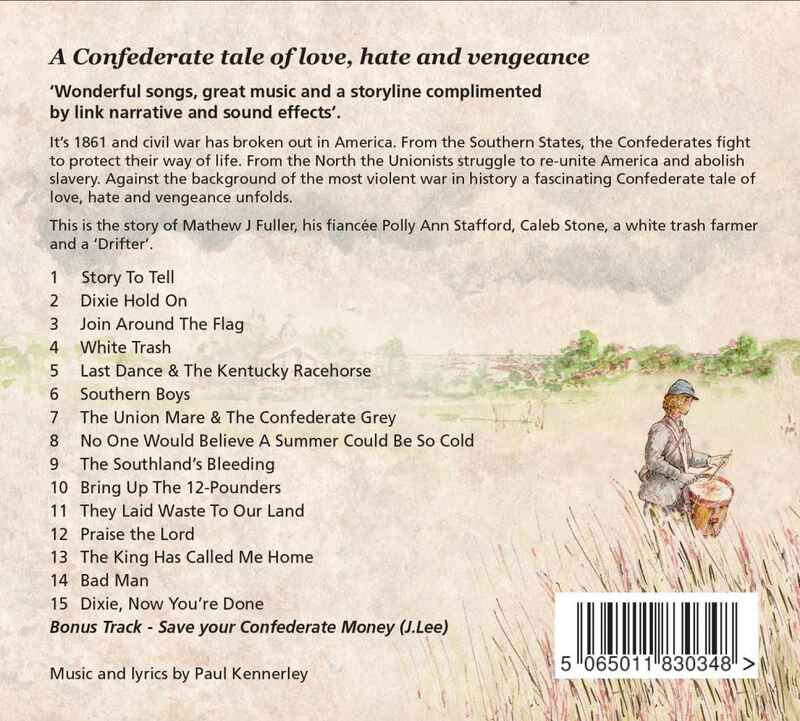 The story is one of the South, for those who know nothing of this Civil War inspired Paul Kennerley work. Of a struggle historically important enough to keep Confederate flag makers in business for a century and a half and misunderstood enough to make certain rednecks earn their general description, which cannot be printed here. It is of a tragedy beyond comprehension which, to this day, most Americans try desperately to comprehend, even if for just a year or so in high school history class. It is of blood and pain and lives destroyed if not lost. Kennerley caught a bit of that, but more he caught the glory and passion of a war long past. Leave it to a musician. Lee's Company recorded White Mansions in toto and live at The Blue Coconut in West Sussex, England. It was a good night. It was a very, very good night in fact. Everything clicked, beginning to end, and it is here in all its, need I say, glory. Never mind that Jimmy Lee sang all parts and never mind that Bernie Leadon and Eric Clapton and Steve Cash and John Dillon of the Ozark Mountain Daredevils were not there putting in their chops and that Waylon and Jessi were not there. Story To Tell, the opening track, put that to rest that night because you knew that everything which followed was going to be good. Maybe great. Some would certainly say so. So allow me to quell any negative comparisons to the original. This is live and the band nailed it. You'll agree if you give it a chance. And for those who have never heard the original, disregard this entire review. Just buy a copy and enjoy it. It's worth the money. The discovery of the ‘White Mansions’ album gave him the focus he’d always wanted but never found. Creative meetings with Derek Green (head of A&M), Glynn Johns (Beatles and Stones producer) and Mansions writer Paul Kennerley (Emmylou’s other half) followed and led to Jim and his band taking the album to the States as a complete show, where he toured it for a year, ending with a four month stint in Nashville. Greatly moving and insightful. Lee's Company can be so proud of the splendid music they have made, as well. I would like so much to actually attend a performance myself. Count yourself lucky if you get to be there my friends! Jimmy Lee's voice is unforgettable. If you enjoy the plain ole country sentiment this praiseworthy UK grassroots album is strikingly packaged, and is pleasingly graced with unfussy arrangements. All I could think of when listening was that Waylon and Co. couldn't have done it better.